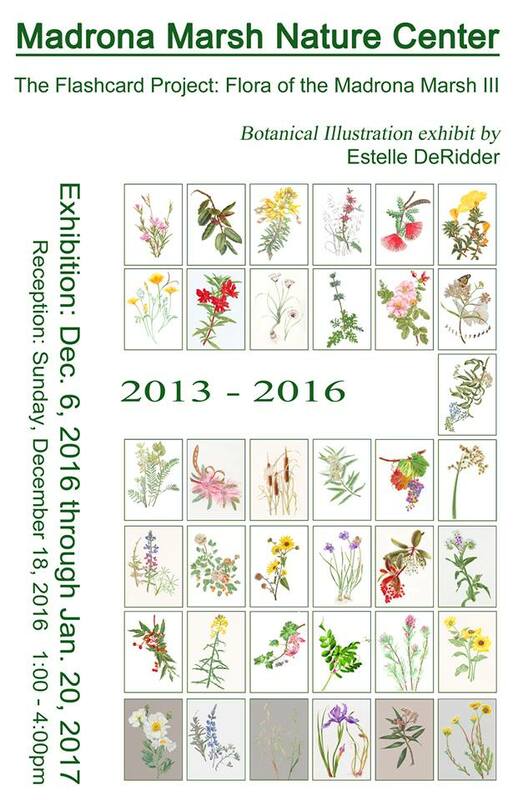 Invitation for Estelle DeRidder’s Madrona Marsh Nature Center Exhibition, © 2016, Estelle DeRidder. In 2012, BAGSC member Estelle DeRidder was awarded an education grant from the American Society of Botanical Artists (ASBA) to use in creating reusable plant identification cards featuring California native plant illustrations from the Madrona Marsh Preserve in Torrence, California. Information about Estelle’s project was presented at the ASBA Annual Meeting and Conference in Denver, Colorado during the ASBA Grant Presentations, October 17, 2014. The public is invited and welcome. The Nature Center at the Madrona Marsh Preserve is located at: 3201 Plaza del Amo, Torrance, CA 90505. Phone: (310) 32-MARSH. The Madrona March is open Tuesday – Sunday, 10 am – 5 pm. If you are interested in applying for an ASBA grant, please apply by August 1, 2017 (open to ASBA members only). Information and the application can be found on the ASBA’s Grant page on their website.